By Christina Fong, 6 Kyu, Age 19. Written May, 2008. The small country of Belize is known for its exotic temperatures, Caribbean beaches, and rich culture. What may be less well known is a Belizean who is a student at the University of Massachusetts. John Nunez is here getting his doctorate of education in social justice. When he’s not focused on his studies, he spends a good deal of his time as the main instructor of the university’s Shotokan Karate Club. He’s a 5th degree black belt and has been training and teaching at the university since arriving here August 2005. Nunez took over for the club’s previous instructor and founder, Sara Grimes, who is a 6th degree black belt. She left to take some time off. His experience is extensive, having begun karate when he was in high school. “I wasn’t good at anything else. I wasn’t athletic. I was never picked for the basketball team,” he said in regards to why he chose to pursue karate. “It was introduced to me by two high school students back from holiday.” His journey began early. To train, he traveled to Belize City and lived there for two years. There he trained under Sensei Frank McKenzie. It was he who brought Nunez to Philadelphia for the first time in 1984. Although he’s currently a long way from home, he is no stranger to being away from Belize for long intervals at a time. 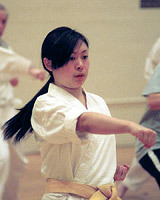 The International Shotokan Karate Federation headquarters is located in Philadelphia. 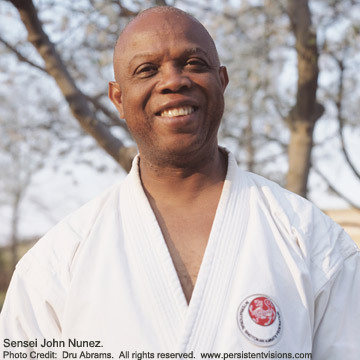 For the past 24 years, Nunez has received most of his training there under Teruyuki Okazaki, who is a 10th degree black belt and head of the ISKF. He traveled there from Belize every summer to train for periods of two weeks to three months. Trainings were intense learning sessions. They would train two to three times between Monday and Friday in addition to Sunday mornings. Wednesday nights were “frightening” since they were reserved for black belt training, which were always the toughest. With a room filled with black belts, Nunez would hope the next person he had to train with would be less able than the last person he was with. The sessions were “fierce and intense” as expected, he said. There are many aspects of training he appreciates and is able to draw new lessons out of. He comments, “It is very technical, exact, scientific I think.” Training itself pays a lot of attention to details. A kick is not just a kick and a punch is not just a punch. The use of hips in karate is highly important. It acts as a fulcrum. The use of total body behind each technique is what helps generate power. His time in Philadelphia was well rewarded. He was the only one from Belize who returned in 1985 and was subsequently asked to be their representative. Today he is the Chief Instructor of Belize. It wasn’t a role he anticipated being in but rather was something that just happened to him. Now that he is currently based in Amherst, these duties have carried over to maintain the same standards of the university’s club members. Nunez spends most of his Monday, Wednesday, and Friday nights instructing students, guiding them through the rigorous training he prepares. The three key elements of karate he must improve upon are kihon, which are basic movements and techniques, kata, which are a series of pre-arranged techniques performed together, and kumite, which is sparring. Karate itself means “the way of the empty hand”; therefore no weapons are involved in training. UMass karate students, or karatekas, train in order to improve and master their skills and to hopefully be able to pass belt examinations held at the end of each semester. The examinations determine whether or not each member has the proficiency to move up a rank, or kyu. There are nine ranks that need to be passed successfully in order to obtain a black belt. His laid-back demeanor is often witnessed after training when the atmosphere of the room had lightened up. He can usually be seen catching up with a couple of students on the side. A strong sense of camaraderie is an important element that Nunez doesn’t fail to facilitate within the club. When he’s not preoccupied with all matters pertaining to karate training, he enjoys good company and some cold beer. He can usually be found unwinding with a few close friends at the local pub, Amherst Brewing Company. “I’ve seen the UMass club grow since I’ve been here,” Nunez stated. When he came to Amherst, the club had around six to eight members. Over the past two years, the club has grown substantially, currently maintaining around 30 constant members. He credits a lot of the club’s growth to the assistance of club seniors Jared Carver, Dru Abrams, and Max Le. While the club is a high priority for him, it isn’t Nunez’s only concern here at Amherst. His primary reason for coming to this university was because it was one of few universities that offered the program he was looking for. He pointed out how he likes the rigor of the program at the university, although he’s not very fond of the cold weather. He’s used to the subtropical temperatures of his native country Belize where his family resides. He received his Bachelor’s degree in physical education at Minnesota State University, Mankato (formerly Mankato State University) 20 years ago. He was able to train and teach karate there as well. He later received his Master’s degree in education leadership in Belize. Updates -- Since the article was written, the author, Christina Fong, has been promoted to the rank of 4th Kyu (purple belt). John Nunez has returned to Belize full-time and has reassumed his role as the BSKA's Chief Instructor. rev. August 30, 2009.